Numerous 11/4Cr-1/2Mo and 11/4Cr-1/2Mo vessels have been constructed and successfully used in various applications in petroleum industry and in other types of service applications. 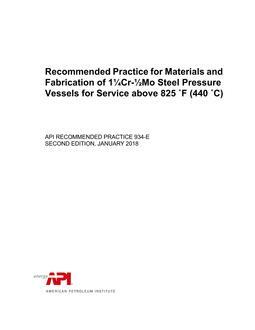 These vessels have been constructed to the requirements of teh ASME Boiler and Pressure Vessel Code, Section VIII, Divisions 1 and 2, and to various international pressure vessel codes and standards. The 11/4Cr-1/2Mo and 11/4Cr-1/2Mo vessels are typically used in service conditions (e.g., high temperature and/or high pressure hydrogen), which require heavy walls and cause in service deterioration. As such, the steels are subject to special requirements, such as notch toughness, elevated temperature tensile properties, hardness, fabriacation heat treatments, etc., which may limit the maximum thickness to be able to meet the desired properties. Corrosion protection by stainless steel weld overlay or cladding may also be required.